Bob Vila Radio is a newly launched daily radio spot carried on more than 60 stations around the country (and growing). You can get your daily dose here, by listening—or reading—to Bob’s 60-second home improvement radio tip of the day. 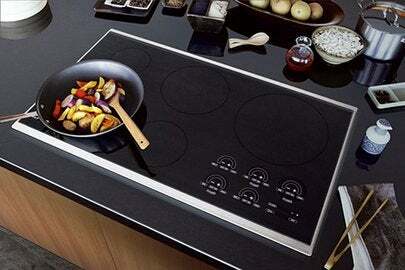 Today, it’s all about Induction Cooking. Gas cooktops deliver only half their energy to cooking. Electric units are less expensive, but they’re only half as efficient as gas. Induction cooking is eighty-five percent energy efficient, which is why it’s been so popular in Europe and Asia for years. Induction cooktops run on electricity, but instead of a red-hot burner, coils under a smooth ceramic glass top heat the pan itself, by magnetic friction. Nothing around it heats up. You can actually touch the cooktop without burning yourself…a nice safety feature. The hitch is, you do need to have cast iron or stainless steel cookware: anything non-magnetic won’t work. At three to five thousand dollars, they’re not cheap, but a low-end induction unit delivers the heat of a fifteen thousand-BTU deluxe gas range, using half the energy of its electric cousins.